I love it when you do that voodoo, that kaiju, that you do so well. Until recently, I’ve had a huge hole in my exposure to Japanese monster movies. I’m working hard to change that and have gone on a Godzilla binge these last couple of weeks in anticipation of the upcoming feature film. Which brings me to this edition of Three Flicks. My rules for Three Flicks are that I watch three films unified by a common theme, actor, director, or character and write about my initial impressions. I prefer to choose movies that I’ve never seen or that I haven’t seen in a long time and don’t remember. I watched all three of these movies on Netflix, who have added no fewer than six Godzilla films to their streaming service. That’s the good news; the bad news is that none of these movies are presented in their original Japanese versions and all are the inferior American dubs, often with footage cut from the films. For instance, instead of the 1954 film Gojira, the original Japanese film that introduced Godzilla to the world, Netflix has the 1956 American version, Godzilla, King of the Monsters, which removed plot points and dialog and inserted Raymond Burr as an American reporter into the action. So, boo. I get it, but boo. Released in America by AIP as Godzilla vs. the Thing, this was the fourth film in the Godzilla franchise. It was made by the Toho production company and was directed by Ishiro Honda, the same man who directed the original Gojira in 1954. In fact, he directed all three of the films I watched, and eight of the original 15 Toho Godzilla films. It’s interesting to me how the tone had shifted in decade between the first film and this film. Mothra vs. Godzilla doesn’t quite go for full comedy and there is still quite a bit of terror and destruction, but the tone is lighter and more playful than that original film. While Godzilla definitely wreaks havoc, people seem to be more like “well, there’s Godzilla again” than fall into full panic. Apparently Mothra was the star of his own earlier kaiju movie in 1961, also directed by Ishiro Honda for Toho titled, surprisingly, Mothra. So this was like a crossover, I guess. This was peanut butter meeting chocolate for monster movie fans. And it’s fine…but I have to admit that the whole thing is kind of boring for me. I like Godzilla as a monster and whenever he’s on screen I’m pretty engaged. Mothra, on the other hand, I just don’t get. He’s a MOTH. He doesn’t really do anything other than fly around and eat holes in all of Godzilla’s favorite sweaters. When that pesky egg eventually hatches things get slightly more interesting. But not much. The second Ishiro Honda film that I watched was the director’s seventh outing with the monster and the tenth in the series, overall. The title on Netflix, Godzilla’s Revenge, is a bit of a misnomer. It movie seems to be more well-known by the name All Monsters Attack. I don’t know why they called it Godzilla’s Revenge, considering Godzilla is friendly here. 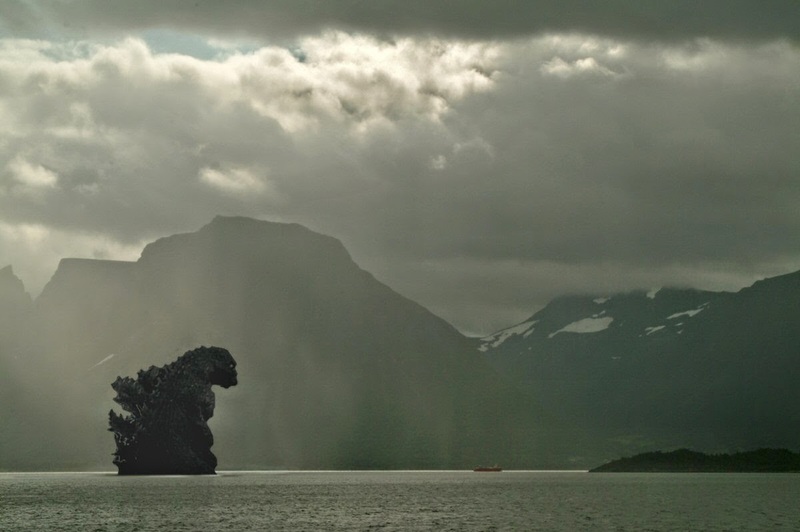 From now on whenever I suffer from bad sushi, I’m going to refer to that as Godzilla’s Revenge. This is essentially a kid’s movie and I had no idea what I was getting into, but I loved every single second of it. The film starts with a funky, swinging song and a montage of Godzilla’s greatest hits, complete with freeze frames. It feels like you’re watching an early 70’s kung-fu movie, only with monsters instead of people fighting. In other words, it’s the greatest thing ever. The “story” centers around a little boy named Ichiro, essentially a latchkey kid whose mom and dad are always working and never at home. Ichiro spends part of his time running from bullies and the other part immersed in his own imagination. He falls asleep while fantasizing about life on Monster Island, which allows the movie to show us what he’s dreaming of. Roughly HALF the film is Ichiro’s BALLS-CRAZY dreams. These dreams start out with Ichiro exploring the island and watching Godzilla fight a bunch of monsters (this appears to be mostly stock footage from previous films), but things get really bizarre when he happens upon Godzilla’s son (?!) Minilla, a tiny guy in a suit (he’s smaller than Ichiro, who is already pretty tiny), looks and sounds like a character from HR Pufnstuf. He’s the broadest thing ever. Meanwhile, back in the waking world, Ichiro has managed to piss off some criminals who are on the run from the law by finding one of the bad guys’ wallet and driver’s license and slipping it in his pocket. So now the thugs are after Ichiro and are willing to hurt him in order to make a clean getaway. Can he use the lessons he’s learned on Monster Island (which he’s only IMAGINED that he’s been to) in order to defeat the bad guys AND the bullies he’s always running from? This movie is ridiculous, but I honestly feel like it knows it and embraces it. It appears to have been made for a grand total of $3.25 (or $16.50 if adjusted for inflation and the international conversion rate). It’s clearly geared toward children; my step-daughter LOVED this movie. I haven’t heard her guffaw so loud since she watched Schindler’s List. We exchanged many percipient glances during the film, acknowledging that what we were watching was pretty awful, yet by the end of the movie we were both won over by the film’s sweetness and sincerity. Consider me a big fan of Godzilla’s Revenge/All Monsters Attack. This is the last film in the series to be directed by Ishiro Honda and also the last of the original Toho cycle of films. The series entered a nine-year hiatus after this installment and wouldn’t return until 1984’s The Return of Godzilla, when the creature, filmmaking, and the world had changed quite a bit. As the last of its kind, Terror of Mechagodzilla is pretty awesome. The film starts with a recap of the events that occurred in the previous film (1974’s Godzilla vs. Mechagodzilla, which is sadly not on Netflix) and it looks like I have missed A LOT. The narrator, who sounds like he’s from an animated Christmas special, informs the viewer that Godzilla came out of the ocean and destroyed many Japanese cities. Some think he’s a god, others think he is the result of nuclear testing. But when the Spacemen from the Third Planet arrived on earth and started attacking, Godzilla became Earth’s biggest ally and sided with the people of Japan to fight these invaders from the sky. The narrator continues, explaining that these space invaders have control over monsters, using them against the people of earth. 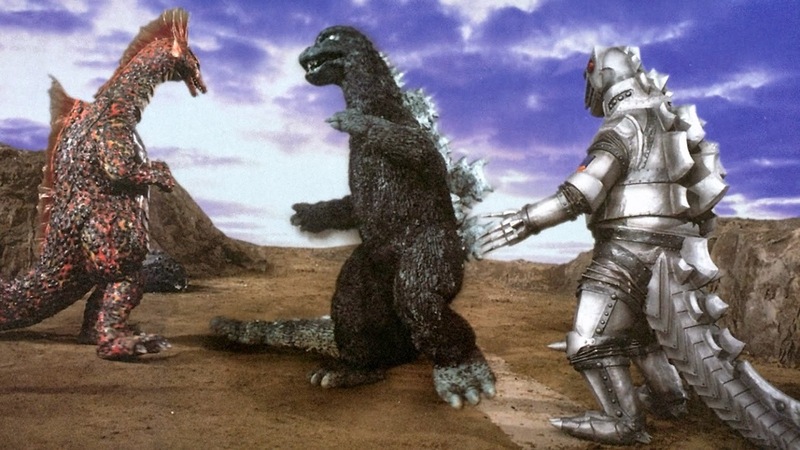 At some point Mechagodzilla was created as a giant robot to fight Godzilla but the machine was destroyed in battle. This film picks up with Mechagodzilla being repaired and the Spacemen from the Third Planet collaborating with the evil scientist Dr. Mafune, who has control over the giant and evil Titanosaurus. Dr. Mafune also has a half-cyborg daughter with unclear loyalties. That’s a lot of setup and a wacky premise, but Terror of Mechagodzilla ties things together in a way that totally satisfied me. For the first hour or so it’s a bit like James Bond with lots of espionage and secret meetings in giant underground industrial facilities. Godzilla isn’t really seen after that opening montage until an hour into the film. When he finally does appear and the table has been set, it’s on like Donkey Kong. There’s even a three-way face-off, a la The Good, The Bad, and the Ugly. Seriously, I LOVE this movie. It’s like professional wrestling, with colorful opponents taking each other out in creative and impressive ways. When Godzilla suplexes Titanosaurus from the top rope of the ring, the crowd goes wild. I write a lot about the level of destruction that appears in so many American movies because it bothers me that our heroes seem to cause massive damage while defending us from those who wish us harm. But I feel like I need to shut my mouth after watching all these Japanese movies because they level their major cities, each containing millions and millions of people, ALL THE TIME and have been doing it for decades. As bad as it is in American cinema right now, it’s way worse in Japanese cinema. And has been for, like, 60 years. I’ve definitely come out of these movies as a fan of Godzilla and will be tracking down as many of these movies as I can for my own personal collection. I’m eager to watch them in their original Japanese and see if any scenes were cut for American release, which is thankfully an option with so many new DVDs and Blu-rays hitting the market. But if there’s a downside to what I’ve discovered, it’s that the 2014’s Godzilla will not have the sense of fun and adventure that I’ve discovered in these movies. It’s bound to be a grim affair. I’ve really come to appreciate how the Japanese films were born out of the darkest moments in history in the aftermath of World War II, yet didn’t languish in the shadow of fear. They faced that fear head-on and turned it into something different, even optimistic. I respect that a lot. And now, thanks to the publicity around the new movie, there’s one more Godzilla fan. Glad to hear the high level of enjoyment. I watched Godzilla vs Monster Zero the other day which was my first Godzilla film. I was pleasantly surprised, but also quite legitimately surprised. Godzilla travels to another planet with space men to fight a monster, and when he wins he does a little dance. ... it was nuts. I started to watch Terror of Mechagodzilla, but I stopped watching after a while due to the the drawn out setup, but from the sounds of things I should keep going, so keep going I shall. I was a bit weary of the sound of Godzilla's revenge due to the more kiddie approach, but I think Ill jump into that one next. Sounds fun. FYI, Hulu Plus has a bunch of godzilla movies on there now too and they are the Japanese versions. They have: vs Hedorah, vs the Sea Monster, Raids Again, vs the Thing, vs Gigan, plus some others that are also on Netflix. if you could see me right now you would see that Im doing a sideways peace sign with my fingers beside my smiling face. HI! Thanks for the heads-up on Hulu-plus' Godzilla fare. I cancelled that service a while back but maybe I should look into it again. Of course, I've also been buying a lot of these movies on DVD and Blu-ray. Because I can't enjoy something without possessing it. Now I have to own your comment. Will you sell it to me? Sure, for $5 or 5 billion yen and is yours. Godzilla vs. Monster Zero was my first Godzilla movie too - stop copying my life, Brad! Heath, I'd pretty much dismissed everything but the original Gojira as being crap, but if you're vouching for them I'll definitely check em out! The Godzilla movies on Hulu appear to be great quality - proper aspect ratio and crystal clear English subtitles. I really enjoyed Godzilla vs. the Sea Monster - one of the humans is a thief who could be a prototype Han Solo. So what you're saying is that Godzilla is US? You guys, if anyone's interested, Amazon has all four of the Sony Godzilla double feature Blu-rays (the heisei and millenium films) for 10.99 each. That's almost 9 dollars off the retail price of each set. This is the lowest they've gotten. Just watched Godzilla: King of the Monsters. Quite a change of pace from the alien invasion with Godzilla as the dancing hero movies. I ended up watching the rest of Terror of MechGodzilla, and you're right HHH it did get nuts. Something that I wasnt expecting was how much these movies are necessarily about the monsters. Even once they get into the 70s B movie style they remain very focused on some semi-complex human relationship/plot dynamics. ... at least thats what ive notiuced in the 3 ive seen so far. Godzilla's Revenge was nutszoid. its like the Neverending Story in a way,, but with more child short shorts. Thanks to this piece, HHH, I have watched all of these movies with my son this weekend. We loved them. I liked all of them better than the new Godzilla. RIGHT? Never underestimate the value of "FUN." Glad to have earned a bit of my credibility back! I'm also especially glad that Charlie watched them with you. Between your family and mine, there's at least two new old school Godzilla fans on this planet that weren't here before.